So… after many sleepless nights thinking about it time and time again, I’ve finally decided to embark on converting another bass to a fretless. Yes, this is not my first time doing this, that’s why I say "another bass". The thing is, I love my MTD bass to death, but I’m always afraid to take it anywhere, both because I don’t want anything to happen to it, and also because I fear that someone will inevitably ask me to play/touch it (of course the answer is no) and I hate the thought of that. (BTW, please don’t ask to play my basses. Neither my MTD nor my Azola… Thanks!) Anyways… So I’ve always thought I needed a cheap "beater" bass that I can take to bar gigs, etc. and not have to worry about anything happening to it. Plus, I really miss having a fretless bass, so it seemed like a good idea to buy a cheap five tring and convert it to a fretless, no? I had a real hard time finding a suitable bass for the right price. I was starting to think that maybe I was too picky and too spoiled after having my MTD and that the only option left for me would be to spend $3K and buy a Willis Bass yet again… Been there, done that, miss it. 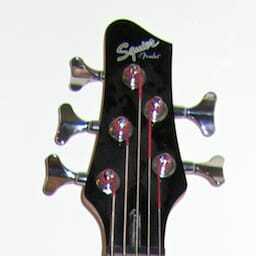 But while it would fulfill my desire for a fretless bass, it would also defeat my "beater bass" intentions. Well, I went everywhere, but finally at my last stop (at Axe Music, surprisingly enough), I was able to find a more-than-suitable five string bass for under $200. Crazy deal. I compared it to many other basses in the store priced at around $1000-$1500, and this bass sounded better, and played better every time. What a deal! I also ended up taking my MTD to the store and comparing it to make sure I was hearing things right. (Which reminds me, I need to change the strings on my MTD…) But yes, the bass sounds good, and I know it will sound great as a fretless. (Gotta love jazz pickups!) It does need some work here and there to get it just right, of course, but I’m used to that. Nothing major. I’m expecting it will be a great bass in the end, maybe even too good to consider a "beater-bass"…?… Hm. it’s a 34" scale five string with 16mm string spacing! Wow. Very light too, which is what I like. But oddly, not as open sounding as I would expect for that weight, but maybe once the paint and finish come off it will be? This is a very aggressive sounding bass for sure though. And has a surprisingly tight low-B string. One of its only cons is that it’s 22 frets and not 24, but it has so much more going for it to make up for that! After ripping out the frets and filling the spaces with dark wood filler (to match the rosewood fingerboard), I’ll be dying the fretboard black (a little bit) and covering it with a thin coat of epoxy. I also plan on shaving down the back of the neck substantially. I was originally thinking of doing a crimson red --> peacock blue --> midnight black sunburst, but I now realize white is probably the only color that will look good with a black fingerboard, and chrome/silver hardware. Originally, I was going to change all the hardware (tuning pegs, bridge, knobs, etc.) 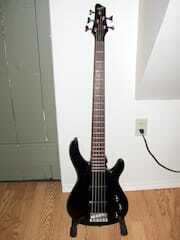 to black, but after researching the price, I realize it’s too much money to spend on a "beater bass". I was also going to put Bartolini pickups and electronics in it, but I think I may forgo that as well. But I do need to do something about the electronics regardless – they’re a tiny bit noisy at times and I’m hoping it will just be a simple grounding/shielding fix, but based on my past experiences, it doesn’t seem like that’s the problem. But hopefully? Anyways, let me know what you think, or of you have any suggestions for anything. This article was written out of order and sort of in a hurry, so I apologize for that. I’ll be sure to update my blog (with pics) of the progress though! After a little research, it seems the body wood is likely Agathis… Hm. I think I may need to buy a sander – the one I’m using keeps dying on me (rechargeable battery). More updates soon! Fretless Bass Conversion… Part I was published on Wednesday, April 22, 2009 at 4:46pm MDT by Daniel Menjívar and last updated on April 11, 2018 at 9:30pm UTC .